Calls on political parties and public to stand by Karu’s decision for vote on 14 Nov. The United National Party (UNP) yesterday lauded Speaker Karu Jayasuriya for seeking a vote on a parliament majority on 14 November and dismissed speculation of a possible dissolution of Parliament as an effort to detract from the dragging constitutional crisis. 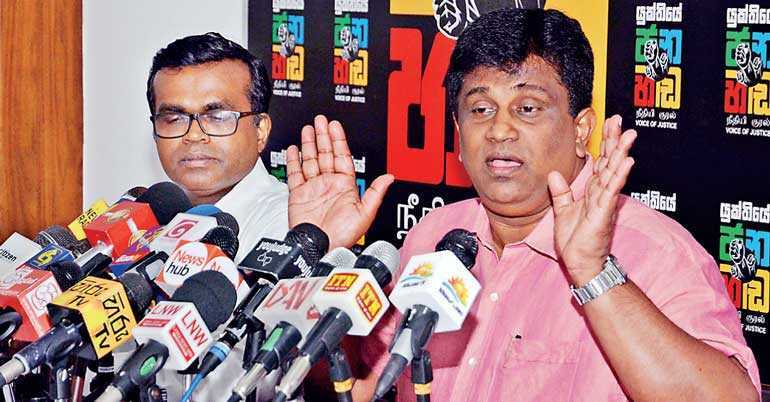 UNP MPs Harin Fernando and Ajith P. Perera were warm in their praise of Speaker Jayasuriya and insisted they fully supported the effort to conduct a vote when Parliament reconvenes on 14 November. They also criticised what they termed efforts by the Sri Lanka Freedom Party (SLFP) to undermine the authority of Parliament by blocking a vote and postponing Parliament after the ceremonial sitting. “What is clear from the Speaker’s statements is that there will be a vote on 14 November. We believe that all Parliament officials must fall in line with the wishes of the Speaker because he is the top person appointed to protect the supremacy of Parliament as well as the privileges of its members. We are not concerned about who sits in the Prime Minister’s chair, all we ask is that the Prime Minister be decided first. Once that is done then whoever it is can sit in the Prime Minister’s chair,” MP Ajith P. Perera told reporters. Perera argued that the Speaker was not under the executive powers and therefore does not have to adhere to every order given by the Executive. As a bipartisan appointee, the Speaker has the responsibility and capacity to work in the interests of all members of the House and not simply of one party. Referring to speculation that Parliament could be dissolved, Perera insisted that would only worsen the current constitutional standoff. Pointing out that under the 19th Amendment, the President can only dissolve Parliament after the completion of four and a half years or by a two-thirds majority in Parliament, he pointed out that even for the latter the House would still need to be reconvened. The UNP also rejected calling a referendum to decide on the question of Prime Minister, arguing that referendums were only a consultation process and did not replace the Constitution. They pointed out that referendums were only held in Sri Lanka to decide on a change to the Constitution and not to decide on the actions of the Executive. “Under Clause 38 of the Constitution there are provisions to remove the President on grounds of insanity. I think it may be time to do this because when you look at the recent actions and statements made by the President it seems as though he is suffering from some kind of mental illness,” Fernando said, strongly criticising President Maithripala Sirisena for making derogatory statements related to a sexual minority during a rally on Monday that have been widely publicised. He also emphasised that the UNP was not against the dissolution of Parliament because they were afraid of an election, recalling that the UNP had called for provincial council elections several times in the past but had been hampered by the reluctance of President Sirisena. “What we are saying is first establish democracy. Then hold elections. We are not scared to go to the people,” he added.